10 years or longer: Honey, sugar, salt, soy sauce, apple cider vinegar, black pepper, Worcestershire sauce and wheat berries (WTF?). 5-10 years: Most dried legumes and whole grains, dehydrated cheese, instant or vacuum-packed coffee, baking powder, powdered eggs and frozen butter. Up to 5 years: Processed (partially hydrogenated) liquid vegetable oils, Crisco shortening, cornmeal and corn flour, and nonfat powdered milk. 2-3 years: Bullion cubes, cornstarch, white rice, powdered gelatin, white wheat flour, white flour pasta, tapioca, textured vegetable protein, hydrogenated peanut butter, catsup, canned salmon and sardines, most dried fruits, and most other canned foods except meats, some fish and fruits, as well as sprouting seeds (alfalfa, mung, soybean, wheat, etc.). Up to 18 months: Canned meats and seafood (halibut, mackerel, tuna and shrimp), unshelled raw nuts, dry active yeast, bagged snack chips, cake mixes, dry pudding, herbal and black teas, bottled juices, most seasonings and extracts, jams and jellies, canned non-citrus fruits (blackberries, blueberries, cherries, pears, peaches, plums, etc. ), cranberry ssauce, pickles, canned rhubarb, and sauerkraut. One year: Canned nuts, breakfast cereals, rolled oats, bottled dressings, mayonnaise, natural liquid vegetable oils, candy bars, bottled juices (grapefruit, pineapple, apricot, orange), canned citrus fruits and natural nut berries. Six months: Most boxed food, fresh potatoes, granola, shelled raw nuts, and unshelled roasted nuts. 30 years or more: Whole grain wheat and white rice that has been packaged to remove oxygen and stored at room temperature or cooler. Up to 30 years: beans, dried apples, macaroni, potato flakes and oats. Up to 20 years: properly stored nonfat dried milk. Baking powder will store for “many years” and baking soda will keep indefinitely. Most food stores longer under cool, dry and dark conditions. Either of Stein’s books is worth owning for the section on root cellars and other cold storage (above- and below-ground), which is accompanied by detailed diagrams and tips, depending on the environment. Of note, compromised cans should be avoided. Don’t waste money on dented cans, and never eat from cans that bulge, leak or spit at you when opened. Most US canaries use BPA, a “known endocrine disruptor that affects hormones and could be causing breast and prostate cancer, heart disease, brain retardation, impotence and infertility.” BPA-free cans are available. Modern Survival Blog recommends clear, see-through bins to keep track of what you have, given that most folks need to see what the have to avoid over-buying one staple and not enough of others. They also recommend a variety of survival foods including bulk, ready-to-eat, dehydrated and freeze-dried foods. Stein also provides a chart for using dry ice fumigation to protect against pests, and spends considerable time discussing the various packaging methods, most of which can be done in the home. “Meals ready to eat” are ideal when you have no stove and little or no water, or if you’re on the move. After Hurricane Isaac, camouflaged men with no identifying insignia passed out boxes of food made by Sopakco. 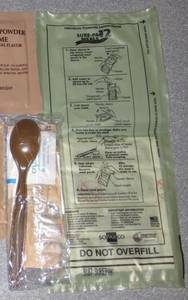 These MREs come fully prepared and include a magnesium heater bag for the main course, with each side dish individually wrapped – scissors not included, but needed. Only the powdered beverage requires water. One full meal packet provides 1,200 to 1,300 calories, so you’d need to eat two or three a day to maintain your weight, depending on how many calories you’re burning through. The meals are varied and palatable, even though stuffed with unpronounceable chemicals and genetically modified organisms (GMO). But, remember, this is emergency food – not food on which humans thrive. Each meal comes with crackers or bread, cheese and peanut butter, a powdered drink, and the main course which could be imitation boneless pork rib, grilled beef patty, sloppy Joe, chili and macaroni, vegetarian ratatouille or beef ravioli in meat sauce. The box comes with 14 meals (a 7-day supply for me), which you can buy online for about $70, and the whole thing weighs under 20 pounds. It’s got an 8-year shelf life (if stored between 33 and 50 degrees F; otherwise as low as one-month if stored at 120 degrees). The heater bag is an MRE’s best feature. Patent No. 5611329 by TrueTech, Inc. uses pulverized magnesium, food-grade iron and sodium which, when combined with a tiny amount of water, reacts to produce scalding heat. According to one site, these heater bags have a 5-year shelf life, and pose not only burn risk, but also risk of explosion as they release hydrogen gas during the reaction. So keep the bag away from spark or flame when “cooking’ your meal. A 14-pound bucket of Augason Farms dehydrated food costs $65, and provides over 2,000 calories a day for twelve days. Budget-wise, this is a much better deal than a box of MREs. The reusable plastic bucket with a water tight lid, and the 25-year shelf life, make this kit a superior choice if you’re not on the run, and you have measuring cups, pans, a stove and water. Eight varieties of food are included, each in its own resealable pouch. Scissors not needed. However, not all the mylar bags were labeled, which only adds to the stress of having to eat emergency food. On the plus side, the federal food stamps program (now called SNAP) does cover the purchase. While these foods are also preserved with chemicals and GMOs, Augason does not add hydrogenated oils, trans fats or MSG. The food is nitrogen flushed and packed with oxygen absorbers. All the food is pretty tasty, and the brown sugar oatmeal was so delish that I added a fresh container of rolled oats to my diet. The cheesy broccoli rice dish only has wisps of broccoli, so I simply mixed it with the beef-flavored vegetarian meat substitute. Sounds gross, I know, but damn it tastes good, just like you’d expect a Whopper® to be deliciously deadly. Northbay Trading sells organic survivor food, but for many the cost is prohibitive. Mat Stein recommends storing and rotating sproutable seeds and provides a how-to section. Most seeds will sprout in 2-5 days, but be aware that non-organic potatoes and tomato sprouts are poisonous, having been treated with fungicide. Stein recommends 20-50 pounds of sprouting seeds and supplies for a one-year supply for an adult male. Activist Post recommends these ten foods available at your local grocer: rice, beans, cornmeal, lard, salt, white and brown sugar, and canned meat, fruit and veggies. Buy a healthy supply of each that you can rotate over time. Survival food storage can’t be fully discussed without mentioning water. The bare minimum is a gallon a day per person, and double to triple that if you’re relying on dehydrated foods. Ure and Levy provide an in-depth discussion of water storage. Take note, though, that most plastic jugs in the US contain BPA (like canned foods), so be sure to buy BPA-free jugs. Some preppers lay in food stocks that will cover them for a year or more and with today’s food technologies, this is entirely possible and easily doable. I’d also recommend not storing all your eggs in one basket; in other words, store your food and water in different places to avoid losing everything in one disaster that affects that room.